At GCC we have a simple philosophy, "give our customers exactly what they want." 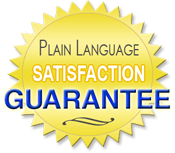 That is our Plain Language Guarantee. We believe that what you want is a very high quality product, manufactured to your exact specifications. To assure you that we will provide exactly what you want, we offer a simple guarantee. We guarantee our products against any defect in material or workmanship. This guarantee is for three years from the date you receive them.